A curated selection of executive opportunities, industry highlights, and unique insights in executive search. 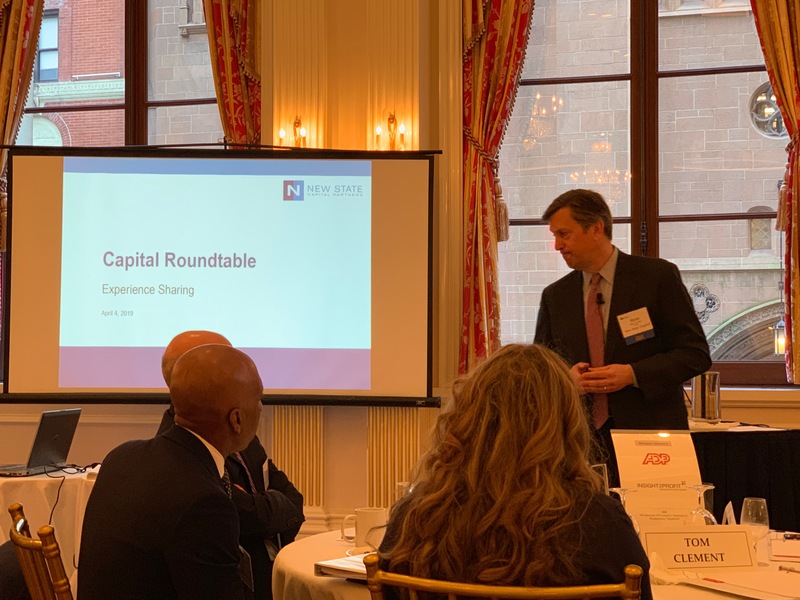 BSG Managing Director Clark Waterfall and Partner Lew Weinstein attended Capital Roundtable Master Class "Best Practices for Creating Value In PE Portfolio Companies" on April 4, 2019 in New York City. With a full day of insights from 20 expert speakers, BSG presents the highlights and takeaways gleaned from attending the sessions. Post acquisition, it’s all about transformation across a finite hold period. And this is often a new concept for founder-built businesses with new private equity backers. Being direct and specific around direction for new portfolio acquisitions is critical. If not, too much room for misinterpretation and misreads on imperatives and priorities. It’s important but often very hard convincing a new PE portfolio company CEO that s/he needs to hire a COO who can be groomed to take over in ~3 years. Succession planning is KEY. Making a decision on keeping or topgrading a CEO shouldn’t stretch out more than a year, as that’s often 20% or more of the average PE hold period. One thing an operating partner should do for value creation? OP’s indispensable role is to build a financial forecast and tactics supporting it for each co.
Be a dissonance seeker... have the unpleasant task of introducing challenge, and data driven unpleasant truths (J Weber). 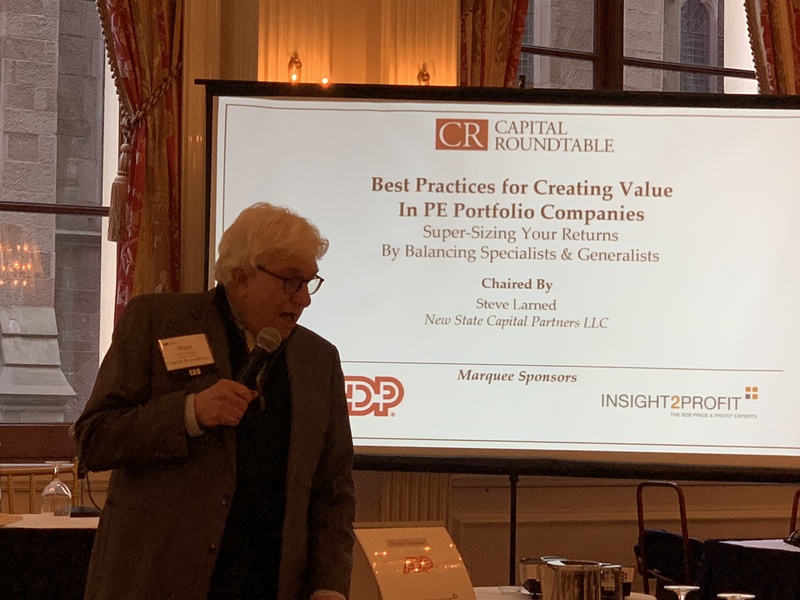 Be progressive with operating partner contribution—focus more on progressive “edgier” areas like the talent equation, predictive performance analytics or similar vs. mature value creation levers like procurement, or offshoring etc that can be serviced by 3rd party specialist providers. Areas of operating partner investment in specialization? Question in the mind of the acquired management team most important to them, whether voiced or not? Middle market companies often have too underdeveloped a set of MIS tools (ERP + other data tracking software) to accurately and in timely fashion collect actionable data for KPI creation, tracking and adherence. The finance function is the most important in driving improvement here. It’s as important to create a set of “TTI”s as KPIs (TTI = “Targets to Improve”). And track as frequently and aggressively as KPIs. Trend has been to use off balance sheet resources and rented specialists (“human cloud”) vs. bulking up W2 owned operating teams, because of the pressure by LPs to not have both “2 & 20” (2% management fees + 20% carry) PLUS valuation creation/operating partner expenses. Re-underwrite every portfolio investment at the end of the 2nd year... not just the clunkers of the group. It can be a tremendous re-energizer for the management team, and can unlock strategies that had been deemed “out of reach” and not viable when first the underwriting at acquisition was originally done. Avoid the blame game... one of the fastest ways to ERODE trust between operating partner/PE investor and their portfolio executive team. Attack the problem not the people. Given a set of opportunities, how effective is a management team in tackling/capitalizing on these? For the first 3 of the 4, what can PE do? Underneath all of these, there is a “management operating system”. Key ingredients to successful “MOS” = cadences, content, collaboration & commitments. Benefit of putting in an “MOS”? You get much more programatic adherence and visibility into an executive team, instead of investor knee jerk reaction which is “hire to execute.” Exec teams can actually be “trained” to execute with a programmatic MOS as a backbone/road map/guardrails. Do it early, and sell the “WIFM” as at tool for management teams to measure their own progress and avoid surprises. And tools for MOS are much less expensive today than 5 years ago. Think big, but start small. Prove it out via piloting via early adopters. Revamping the sales team might take 24 months to realize the investment. Doing a sourcing review is faster though shallower IRR. Funds that have an “exit committee” inside the GP is looked on favorably by LPs when evaluating PE funds into which to invest. This construct takes some of the pressure/burden off the portfolio executive teams and also allows portfolios to usually eke out any last area of value creation before exiting. Ready to work with BSG? We help the best in the business find the best for their business. We believe that the globe of talent is comprised of two hemispheres – optimizers and builders. Each is critical for different stages of company growth and development. BSG's focus is on the builders. Copyright © 2019 BSG Team Ventures . All rights reserved.